Maybe it is fitting that, after a week of international flavors, from Regina Carter’s “Reverse Thread” project featuring one of Africa’s premiere kora players to Larry Coryell’s “Bombay Jazz” with prominent Indian musicians on flutes and tablas, we have a weekend of our own “roots” music from big band to folk to post bop. But we’ll expand more globally again with a rare appearance by Israeli pianist Anat Fort and the return of Arturo Sandoval. The JazzMN Big Band is always a treat, and whenever they are in concert, there’s definitely a shortage of great jazz artists available for any other venue that night. Think of the sax section alone, which normally boasts Dave Karr, Dave Milne, Pete Whitman, Dale Mendenhall and Kathy Jensen? This Saturday night (3/20), the JMBB brings on composer/bandleader/educator Fred Sturm, head of the music conservatory at Lawrence University, and special vocal guests Voice Trek. The charts are modern, the setting musically perfect at the Hopkins High School Performing Arts Center. Also Saturday night, there is no more eclectic musician out there than Claudia Schmidt. Known to some only through her Prairie Home Companion stints and folk music releases, Claudia can swing through the Great American Songbook with ease and, on her new release (Promising Sky), also incorporates some traditional African rhythms as well as some more distinctively backroads Americana. She’s doing two solo sets at Gingko Coffeehouse in St. Paul. Down at the Artists Quarter this weekend (3/19-20), one of our local jazz treasurers, drummer Eric Gravatt, takes the bandstand with his Source Code ensemble. 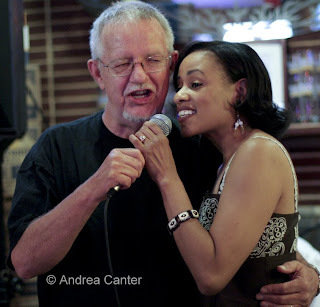 Gravatt has been a long-time cohort of the great McCoy Tyner, and with Source Code he is in the driver’s seat. 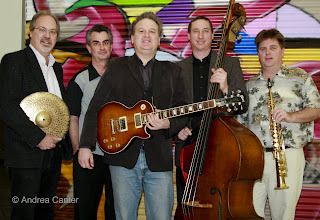 Going in a somewhat funkier direction, Pooch’s Playhouse will keep the AQ stage ablaze with a Sunday evening (3/21) gig sponsored by the Twin Cities Jazz Society’s “Jazz From J to Z” series. The Playhouse includes Pooch himself—Bruce Heine—on bass, with pals Joel Shapira, Mark Asche, Dave Brattain and Dave Schmalenberger. Earlier on Sunday, the MacPhail Center for Music offers a public, free-of-charge workshop led by Israeli pianist Anat Fort at 3 pm. Fort, a former classmate of Adam Linz at William Paterson University, calls on Adam and JT Bates to help convey “The Art of the Piano Trio.” They will follow the workshop at 6 pm with a trio performance ($10 tickets) in the beautiful Antonello Hall. 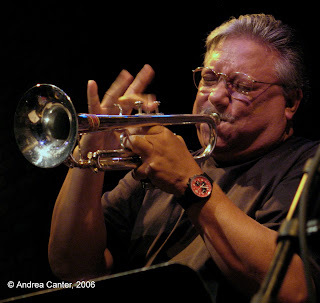 One of the living legends of jazz and Latin trumpet, Grammy (and Emmy) winner Arturo Sandoval returns to the Dakota (3/22-23) where we might expect him to spend as much time at the piano as on the horn. Whatever instrument, it will be a virtuosic evening. It seems to be Charmin Michelle week as the buttercream singer appears with the Laura Caviani Trio at Crave/Galleria on Friday (3/19); pulls a double header at Crave/West End Shops and Cinema Ballroom on Sunday (3/21); holds her regular gig at Fireside Pizza with Denny Malmberg on Monday (3/22); pairs with long-time cohort Joel Shapira at Hell’s Kitchen on Tuesday (3/23); goes back to Hell the next night (3/24) to front Doug Haining’s Twin Cities Seven, and seems to take off Thursday to rest! Other vocalists in the spotlight: Nichola Miller at Honey on Friday (3/19) and Spoon River on Thursday (3/25); Erin Schwab at Hell’s Kitchen on Saturday (3/20); Debbie Duncan with Mary Louise Knutson at Camp Bar on Tuesday (3/23); Connie Evingson at the Dakota (3/25); Maud Hixson at Erte (3/25); Katie Gearty with Vital Organ at Honey (3/25). And more jazz: The great New Orleans sounds of Jack Brass, Dakota Late Night on Saturday (3/20); Zacc Harris Trio at the Riverview on Sunday (3/21); Fat Kid Wednesdays on Monday at the Clown Lounge (3/22); the Cory Wong Quartet followed by the Tuesday Night Band at the AQ on Tuesday (3/23); great options in brass with the Adam Meckler Quintet at the Dakota; Joe Smith Quartet at the AQ, on Wednesday (3/24); and the always explosive Pete Whitman X-Tet at the AQ on Thursday (3/25). Coming soon: the vibrant future of jazz with the Jake Baldwin Quartet (Dakota Late Night, 3/26); Brazilian breezes with Eliane Elias at the Dakota (3/29-30); Maud Hixson and Erin Schwab take on Noel Coward at the Guthrie (3/30-4/3); amazing gong and drum artist Nakatani at Rogue Buddha (4/3); Brad Mehldau at the Dakota (4/6-7).